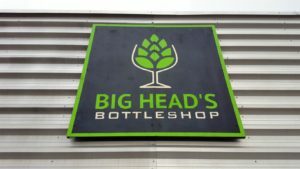 Missoula’s newest beer store, Big Head’s Bottle Shop, will hold it’s grand opening this Saturday, October 21, from 1:00 p.m. to 7:00. p.m. Formerly a part of Summer Sun Garden and Brew, the bottle shop was spun off as a separate business when the stores relocated this summer to adjoining suites at 3106 W. Broadway Street. The Grand Opening will feature giveaways, including a ceramic growler from Southern Growler and shop gift certificates, plus brewery swag and plenty more. 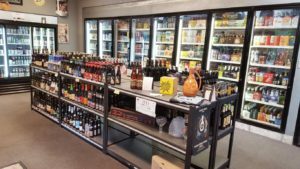 You’ll also have the chance to visit the new Summer Sun and its expanded selection of homebrewing supplies. Robinson, whose head gives every indication of being a normal size, said the shop’s name stems from a childhood nickname related to his mother’s penchant for turtlenecks. More than 500 options fill the coolers and shelves with beer from around the world. 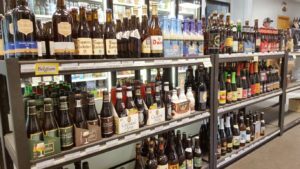 Montana beers from as far away as Meadowlark in Sidney to HA) Brewing in Eureka take up more than three cooler doors while Belgian and other imports line the aisles. And it’s not just beer. Big Head’s stocks a nice selection of hard ciders as well as mead and wine. Big Head’s is a verified venue on untappd. Once you’ve connected you can receive notifications when the store receives a new beer or schedules an event. You can also follow Big Head’s on Facebook for new beer additions, specials and more. 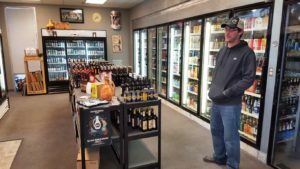 You’ll find Big Head’s Bottle Shop at 3106 W. Broadway in Missoula. Owner Jared Robinson shows off Big Head’s Bottle Shop and blinks just as the photo is snapped.